We are very well aware that what we eat affects our body. Not-so-surprisingly, it also affects our mood, the brain functioning, our memory, and even our ability to think, handle stress or simple daily tasks. Maintaining weight and staying fit shouldn’t be the only goal, but we also need to make sure we eat the right foods so that our body functions at its best and our organs stay healthy too. I would now like to throw some light on the high-powered organic engine of our body- The Brain! Our brain regulates innumerable complex functions in our body and is constantly working even when we sleep! It stores an incredible amount of information in the form of images, texts and concepts. We need to ensure that we constantly supply the fuel that our brain needs for its round the clock functioning. The best fuel for our brain is- Glucose, which is obtained from the carbohydrate-rich foods that we consume- Fruits, vegetables, whole grains, etc. Apart from this main driving fuel, our brain also requires certain specific nutrients just like our heart, lungs or muscles do, to run efficiently. Nutrients like Vitamin E, iron, folate, essential fatty acids (EPA and DHA), vitamin C, B12, zinc, etc. play a vital role in our cognitive functioning. 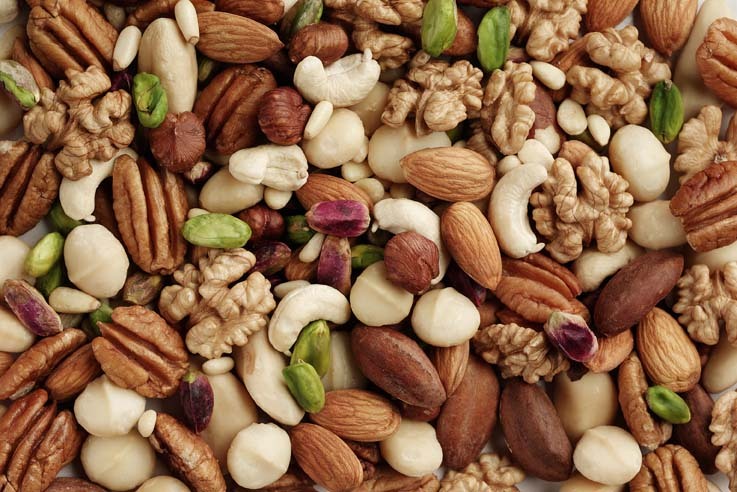 Nuts, especially walnuts and almonds, are extremely good for the brain and nervous system. They are packed with omega 3 and omega 6 fatty acids, vitamin B6, and vitamin E. Our brain is made up of 60% fat and low levels of good fats in food and body can contribute to depression, Alzheimer’s, and dementia. Vitamin E has been shown to prevent dementia by protecting the brain from free radicals. The active form of omega-3 fats, i.e. EPA and DHA, occur naturally in fatty fish like tuna, salmon, mackerel, sardines, herring, etc. Make sure you do not fry these fish as Omega 3 gets destroyed at high temperatures. Steaming or grilling is the best method to cook fish. DHA is an essential during pre and postnatal brain development. In infants, DHA is needed for the growth of brain cells and other brain structures. It has not only shown to improve memory but also prevents the age-related memory loss. Greater incorporation of DHA into cell membranes prevents the brain, especially the neurons from oxidative stress. Vegetables like collard greens, spinach, broccoli are good sources of B complex vitamins, beta-carotene, iron, folic acid, fibre, etc. These nutrients protect against free radicals and excavate the heavy metals that can damage the brain. Folic acid is linked to lowering the levels of homocysteine ( a non-protein amino acid) in the blood, which otherwise may trigger the death of nerve cells in the brain. This creamy treat is a rich source of MUFA, omega 3 and omega 6 fatty acids. It also comes with many antioxidants of its own, including vitamin E and Vitamin C, which protects the body and the brain from free radical damage. They are packed with Vitamin E and contain a rich mix of protein, omega fatty acids, and B complex vitamins. These seeds also contain tryptophan, which the brain converts into serotonin to boost mood and combat depression. We can sprinkle them on top of our salad or consume directly as a snack… well, I would say, a Brain-boosting Snack! These are antioxidant powerhouse which protects the brain from oxidative damage due to the free radicals which can prevent premature ageing, Alzheimer’s and dementia. The flavonoids in the berries also improve the nervous impulse transmission, improve memory, learning, and all cognitive functions. Here’s a good news for the chocolate lovers! The flavonols in chocolate improve blood vessel functioning, which in turn ensures smooth flow of blood to the brain thereby improving our cognitive functions and memory. Chocolate also stabilizes our mood and eases our pain (goes without saying). Hey, but not to forget, moderation is the key! 2 pieces of 70-80% dark chocolate are more than enough to keep our mood and the brain cells happy. It’s a list of simple foods that are easily available and we do consume these on and off. We can now pay a special attention to them and consume them more often to keep our Brain super-healthy!